Similar in shape to many plovers, the ruddy turnstone is a unique shorebird with a circumpolar range that makes it one of the most widespread shorebirds in the world. Often described as having calico or tortoiseshell plumage, this striking member of the Scolopacidae bird family (formerly classified in the Charadriidae family) is easy to recognize. This fact sheet reveals other amazing traits of these colorful shorebirds. These birds have a stocky build and short legs. The black bill is stout and sharply pointed, with a very slight upturn at the tip. Males and females are similar, though females tend to be slightly duller overall. In breeding plumage, these birds have a black and white face with fine dark streaking on the crown. The upperparts are mottled black, brown, and buff with variable amounts of rusty red in the shoulders and wings. The nape is pale and the chin and throat are plain white. The breast is covered by a black bib but may show some white within the bib, particularly at the sides, and the rump is black. The underparts are plain white, and the legs and feet are orange. In flight, the wings show a bold pattern with black, white, and brown or red. The tail shows a broad black patch and a white tip. In non-breeding plumage, these birds are more brownish overall, especially in the wings, head, and face. The winter bib will show more gray than black. Juveniles are similar to non-breeding adults, but have a scaly pattern to the upperparts because of buff edging on the feathers. This edging wears off gradually. These birds have a rattling, staccato chirping or chattering call of multiple syllables that grow more rapid at the end but maintain the same general pitch. A lower-pitched "pew" note is also common. These shorebirds prefer tundra habitats, rocky coasts, or coastal spits and similar areas such as jetties or breakwaters during the summer breeding season. They are more widespread along all coastlines, beaches, and coastal mudflats in the winter. Turnstones are found on every continent except Antarctica. During the summer, ruddy turnstones are found throughout the Arctic tundra regions of Canada, Greenland, Scandinavia, and Siberia. In the winter, they migrate to the coasts of western Europe, Africa, the southern United States, various Caribbean islands, and Central and South America as far south as central Chile and northern Argentina, Australia, New Zealand, a number of south Pacific islands, and even Hawaii. Vagrant sightings are regularly recorded further inland than expected, particularly during migration. Around the Great Lakes region these birds are more common migrants, as well as similar large inland coastal habitats in Europe and Asia. While foraging, these birds often explore the tide line or piles of debris, flipping and turning shells, stones, and driftwood to seek out prey beneath different objects. Several birds may work together to turn over larger objects. Ruddy turnstones are often seen alone or in small groups, though they can form flocks of thousands of individuals after the breeding season, and often congregate in mixed flocks with other shorebirds. Turnstones take alarm quite easily, and other shorebirds heed those alarms as well. These birds can be aggressive during the nesting season and will vigorously chase intruders, even much larger birds. They often perch on top of boulders to watch for potential threats. Turnstones have a jerky walking gait and their flight is direct and straight with rapid wing beats. Ruddy turnstones are carnivorous birds and will feed on a wide range of prey available on shorelines. Insects, mollusks, crustaceans, worms, larvae, and eggs make up the bulk of their diet. When carcasses of fish, whales, seals, and other marine life wash up on shore, these birds will even eat carrion. Turnstones are monogamous and may remain with the same mate for several years, though not necessarily for life. Males court females by making several shallow scrapes, though it is the female who finally decides the nest site and lines the scrape with lichens, moss, grasses, and similar plant debris before laying eggs. The oval-shaped or slightly pointed eggs are olive-green or dark buff and marked with brown and black splotches. There are two to five eggs in a typical brood, and while both parents share incubation duties, the female generally does more incubation. After 21 to 24 days, the eggs will hatch, and the chicks are able to leave the nest and feed themselves in less than a day. Both parents guide and protect their offspring, though the female parent will often leave early, before the chicks can fly, while the male will finish their care. Young turnstones make their first flight when they are 19 to 21 days old. Because of the short breeding season in these birds' northern breeding grounds, only one brood is raised each year. Because of their widespread range and often inaccessible breeding habitat, ruddy turnstones are not considered threatened or endangered. They are susceptible to a number of threats, however, particularly invasive predators in breeding areas and environmental disasters such as oil spills that threaten coastal habitats. In the tropical areas of their wintering range, ongoing development of coastal regions for resorts or other uses can be a problem. These birds may also be susceptible to coastal changes brought about from climate change, though that impact is not yet well understood. These shorebirds are not backyard species, but protecting coastal habitats can help attract them to a region. Artificial breakwaters and boulder jetties can be attractive areas for turnstones, especially if barnacles and similar prey is abundant. Ruddy turnstones can be relatively easy to find because their range is so widespread. 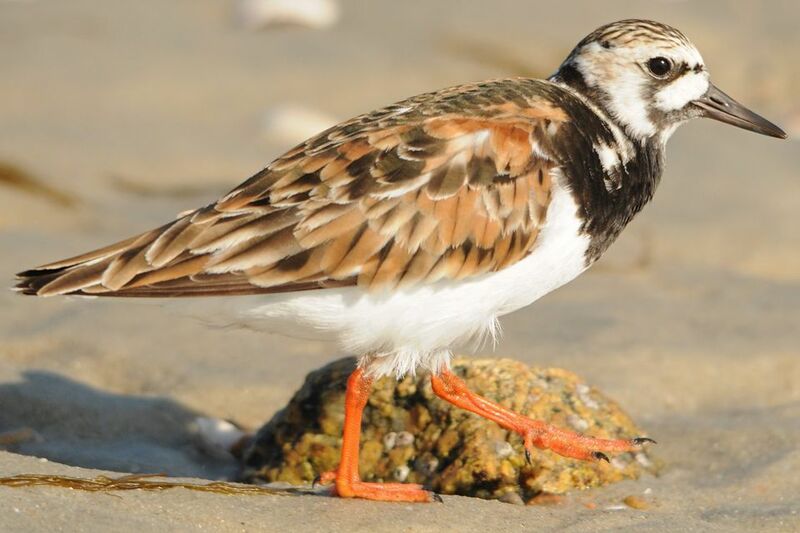 Visiting beaches, jetties, and other coastal shorelines during winter can provide many ruddy turnstone sightings. Watch for these birds wandering along the wrack line as they search for prey, and they may also be seen in mixed flocks with other shorebirds such as sanderlings, surfbirds, and plovers. The ruddy turnstone is just one of the world's fascinating shorebirds. Birders should take care to learn the different types of shorebirds so they can more easily notice and identify turnstones. While at the beach, it's also useful to learn the different types of seabirds and brush up on fun gull trivia at the same time! Don't miss our other detailed bird profiles to discover more of the world's most amazing birds.